Looking for more serious drums for your Guitar Hero/Rock Band addiction? Logitech has a set of premium drums, and they're asking a premium price for them: $230. Yep, the price for the drums exceeds the price for the game and full set of regular instruments. But these things are seriously solid for that price, feeling more like an electric drum kit you'd buy at a real music store rather than a big toy like the regular drums. In addition, these use an RF-based signal with a USB dongle rather than Bluetooth, which cuts back on latency and offers backwards compatibility with the PS2. Look for these to hit stores later this month. FREMONT, Calif.—So you can really rock out to Guitar Hero® on the PLAYSTATION®3 (PS3) computer entertainment system, Logitech (SIX:LOGN) (NASDAQ:LOGI) today introduced the Logitech® Wireless Drum Controller for the PLAYSTATION 3 system. 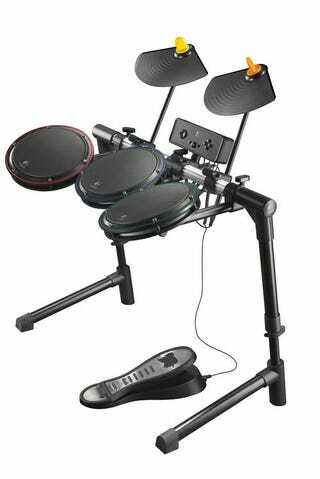 Licensed by Activision Publishing, Inc. (NASDAQ: ATVI), for the award-winning Guitar Hero franchise, the Wireless Drum Controller features premium drum heads with recessed rims – making it easy for you to play like a rock star. "When you're ready to experience a new premium drum controller or expand your band, you'll want to rip on Logitech's new drum controller," said Ruben Mookerjee, Logitech's director of product marketing for gaming. "With the Wireless Drum Controller, you can mark time, keep the backbeat, color up your riffs and crash down on the cymbal pads. Joining the Logitech® Wireless Guitar Controller, the new Wireless Drum Controller lets you rock out to your favorite songs on the PS3 system." The Logitech Wireless Drum Controller features three fully adjustable drum heads and two cymbal pads. Each piece can be positioned to fit your reach and suit your style. Offering a unique playing experience, the new Logitech Wireless Drum Controller provides quiet, responsive heads that deliver a lively feel, won't distract you from the music, and are designed to let you take advantage of all the latest features of Guitar Hero games. Delivering up to 50 hours of battery life on two AA batteries, the Wireless Drum Controller gives you enough juice to perform a concert's worth of hits, encores included.